Planning a family day out? Our favourite museums make learning effortless and fun (for adults as well as children). 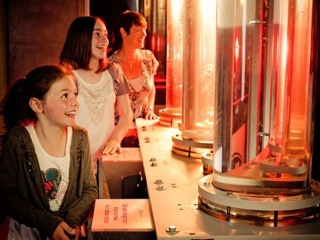 For hands-on science for all ages head to the action-packed W5 in Belfast, one of the top family attractions in Northern Ireland where you are invited to touch, feel, smell and press everything in sight! You can launch hot air balloons, understand the science of forces by climbing up Rapunzel's hair and climb two storeys high at W5 in Belfast. Chris and Miranda Emmerson visited with daughters Alice, 5, and Rosalind, 3. I have become something of an expert in children's science museums in the past five years, even to the point of developing science museum ennui. 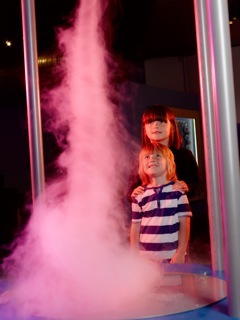 However, W5 (which stands for what, who, where, when and why) is an outstanding example of how modern museums are bringing science to life for even the youngest visitors. Filled with enough games and puzzles to fill a week of visits our children were in seventh heaven as they built, span, cycled, blew and climbed. In fact, it was extremely difficult to persuade them to leave. Tickets to W5 include all-day entry, which means you can arrive at ten, pop out for lunch or a visit to Titanic Belfast (situated close by) and then drop back in again to allow your children to tear round madly until six o'clock. The interior of W5 has been well designed to give the visitor space to move around and take in its myriad wonders and W5's creators have done brilliantly at keeping parents and carers in mind. There is plenty of seating, numerous places to get drinks, easily accessible children's toilets and quiet areas with large comfortable sofas where grandparents can collapse for a few minutes or parents can feed babies. The staff are friendly and helpful and the exhibitions easy to navigate. Rosalind loved the hot air balloons on the ground floor, which she could fill and launch, and we all enjoyed blowing giant smoke rings into the sky. The Discovery centre on level two is designed for under eights and offers life size cars to drive, shops to run, boats to sail, a rock star studio, a play cafe, a fairy tale castle and endless computer-generated interactive games to try. Rosalind also enjoyed the galleries for older children, especially the See/Do exhibit which encourages all its visitors to build and construct. 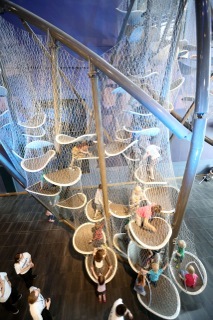 The Climbit activity frame – more than two storeys in height – swoops through the centre of W5, a silver net filled with white petal shaped steps. Children from 3 to 16 are invited to climb and play on this to their heart's content and Alice was happy to burn off some energy whizzing up and down. Even Rosalind managed to make it to the top and then very, very slowly back down again. While Alice loved the Discovery centre she also enjoyed the Go exhibit next door where kids can – amongst other activities – test out the theory and physics of using Rapunzel's hair to climb a tower as they winch themselves up and down using ropes and pulleys. The See/Do exhibition gave her the chance to examine butterflies under microscopes and build teetering wooden towers. The Go exhibition on level two offers the older child more sophisticated games and activities exploring topics such as the geology of Northern Ireland, criminal pathology, the laws of physics and practical electronics. The See/Do exhibition on level four offers giant construction sets, live chemistry demonstrations, wave machines, agricultural games and ecological challenges. Unlike some other science museums we've visited there is more emphasis on play and discovery and less on text-based information. I personally think this is a strength of W5 but much older children might sometimes wish for more in-depth information. The Climbit climbing frame – unlike anything we'd ever seen before. The children were thrilled to be allowed to climb so high and it was brilliantly designed to keep everyone safe! 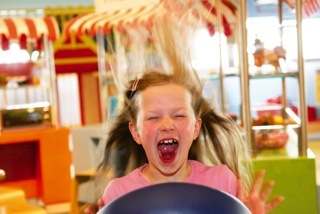 For Easter there were a range of fairground games and carnival attractions included in the price of admission. At Christmas, there is normally a chance to visit Santa and other seasonal entertainments. Everything apart from the present from Santa is included in the ticket price and you don't need to book in advance. Throughout the year W5 hosts special days and weekends themed around topics such as robots, space exploration, Star Wars and dinosaurs. These are always included in the price of entry. See the website's What’s on guide for details. As well as the permanent exhibition galleries there are temporary exhibitions. When we visited these included tiny fairy tale sets designed by the man who devised the sets for The Hobbit. There was also an exhibition of bird photography. There is a large cafe on the mezzanine level offering sandwiches, snacks and coffee and a coffee stand with tables on level two. Alongside the mezzanine level cafe there are a range of picnic tables, with more available on level three, so you can bring your own food. W5 is part of Odyssey, Northern Ireland’s Landmark Millennium Project. It's only a five minute walk from the Laganside Bus Centre via Queen Elizabeth Bridge or Lagan Weir Bridge, and a ten minute walk from Titanic Quarter Rail Station. Family tickets (2 Adults & 2 Children) start at £25.50, with under 3s free, and allow all-day admission. Season tickets are also available. Opening hours are Monday - Friday: 10am - 5pm, last admission 4pm; Saturday: 10am - 6pm, last admission 5pm; Sunday: 12pm - 6pm, last admission 5pm. Allow at least two hours to visit W5. There is an excellent science-themed shop on the ground floor offering toys, models, science apparatus and outdoor play things. Pocket money options include funky torches, mini microscopes and lots of glow in the dark goodies.